When life is sour, say thank you and grow. Bean salad gains its unique flavor from lounging in a sweet and sour marinade. When I gamely agreed to adhere to a stringent Whole30 Challenge last January, I was forced to adapt favorite family recipes to fit within the rules of the program. 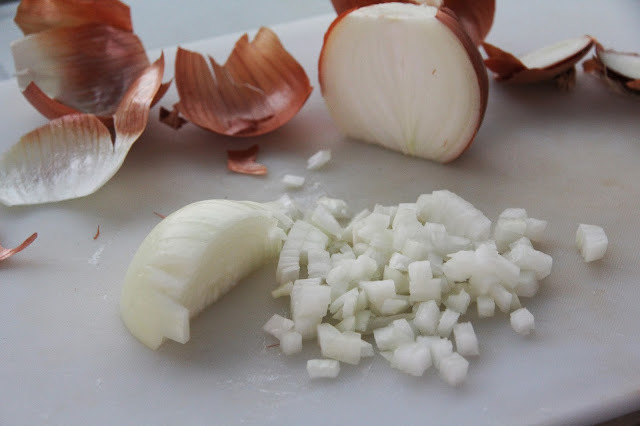 I'm constantly tinkering in the kitchen so I looked at the requirement of adapting long-loved recipes as more of an adventure than a pain in the neck. Modifying recipes to be gluten-free or Paleo compliant has introduced me to a variety of new ingredients that I now include as standards in my already overstocked pantry. These items primarily include coconut-based items such as: Coconut Aminos, Vivapura Coconut Flour, Coconut Sugar, and Coconut Oil. I also particularly like Wellbee's Super Fine Almond Flour, Red Boat 40°N Grade Fish Sauce and Avocado Oil. I have also successfully swapped honey and homemade honey syrup for refined sugar in a number of recipes including salad dressings, marinades and beverages. This year for my "Going Clean in 2016" campaign that I kicked off the second week of January, I have further reduced the amount of unrefined sugar in my diet. I no longer add honey to my coffee, or any beverage for that matter, and I am consciously doing my best to identify and eliminate excess sugar from my diet whether it is refined or unrefined. I've been juicing vegetables everyday for a nutritional boost and I've started exercising daily. No matter what program my husband and I follow for improved health, one thing is for sure. He will not forsake Four Bean Salad. He loves it so. 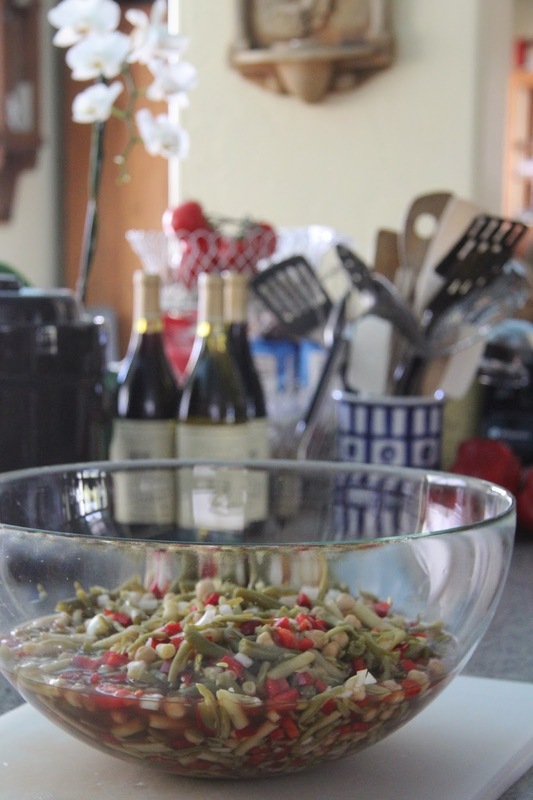 I documented his love for Four Bean Salad in this post with a recipe calling for granulated sugar. What makes Four Bean Salad so delicious is the sweet and sour marinade. Honey is actually sweeter than granulated sugar, so it should not be swapped one-for-one in a recipe. For a non-baking recipe, to replace one cup sugar, you can reduce the same amount of honey by two to four tablespoons, depending upon your desired final outcome. We like the marinade to be on the sweeter side, so I reduced the amount of honey by 1/4 cup instead of 1/2 cup. 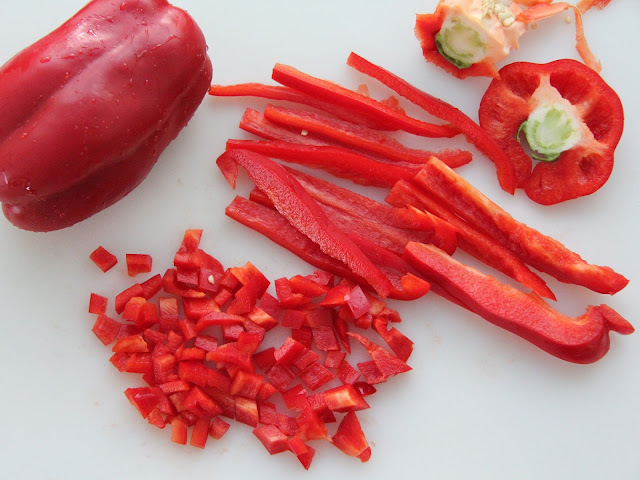 Red bell peppers take the place of kidney beans in a paleo-friendly bean salad. To be clear, this recipe is not Whole 30 compliant. It is loosely Paleo-friendly, if the garbanzo beans and kidney beans are omitted. I say "loosely" because a Paleo lifestyle completely eliminates refined sugar and only small amounts of honey are allowed. Granted, this recipe has a lot of honey, but my husband and I use a slotted spoon to scoop up portions of the bean salad as a quick and tasty topping for green salads and we let the marinade drain back into the bowl. From my unscientific estimates, once the beans are drained, most of the marinade is left behind. After I finished being stringently Paleo, garbanzo beans were added back to the mix. Why? Because we love them so. Especially in this super smooth hummus recipe. Divine! I tried to strictly eat Paleo through the last months of winter and in to early spring of 2015 and found the kitchen prep too labor intensive. And this revelation is coming from me, a person who cooks regularly from scratch with whole foods and lots of organic vegetables. I really tried to stay true day after day, but on hectic evenings when I just needed to whip out a dinner, I did what I needed to do (without guilt, I might add). I also went on a bit of a gluten bender this summer, especially with my trips to Denver, New Orleans, and Northern California. Life is short—I wasn't going to pass up trying a Po' Boy and Beignets in the Big Easy or Dim Sum in San Francisco or cup after cup of Linda's Aged Holiday Egg nog. (Seriously, that boozy eggnog is bomb.) I paid for it though around my mid section. Much to my chagrin, I finally stepped on the scale on New Year's Day. After squinting to read the digits with my near-sighted eyes, I made a very sad frowny face, and then stepped off the scale. I may have even blurted, in an exasperated tone, a bad word or two. I didn't need a crystal ball with me in the bathroom to foresee my immediate future. I'd be joining the other millions of people who resolved to embark on a bright and shiny new year by undertaking a new eating and exercising campaign. I have once again locked down my eating and exercising routine. Unfortunately, this is not my first weight-loss rodeo. It's back to careful eating, with a splurge here and there (I am human after all), and it's definitely back to the gym. Channeling Nike's slogan, I just need to do it. At least I can still have this Four Bean Salad as part of my forthcoming eating regimen. Hallelujah for small graces in the kitchen. According to an article in SFGate, "Garbanzo beans, also known as chickpeas, are consumed more than any other legume in the world, as reported by the Yuma County Cooperative Extension. Like peanuts and soybeans, garbanzo beans are legumes. If you have an allergic reaction to soy or peanuts, you may also be allergic to garbanzo beans, according to the Cleveland Clinic. Signs of an allergic reaction may include nausea, diarrhea, itching, tingling or swelling around the mouth or difficulty breathing." Likewise, kidney beans require extended processing for "safe" human consumption. In The Perfect Health Diet, the authors write, "Legumes are so toxic in their raw state—raw kidney beans at 1% of diet can kill rats in two weeks—that they need processing to reduce toxin levels. Traditional methods of reducing toxin levels are soaking, sprouting, boiling, and fermentation." I wrote previously about my husband, Jay's love for Paisley Farms All Natural Four Bean Bean Salad, which Costco formerly carried on a regular basis and is now only stocked seasonally. My husband decided he can live without the kidney beans but not the garbanzos. For the kidney beans I retained the red color accent in the salad by adding diced red bell pepper for the traditional diced green pepper. If you do not want to consume a legume to adhere to the Paleo eating plan, simply replace the garbanzo beans with additional green or waxed beans. Alternatively, diced and blanched carrots might make an interesting and colorful substitution. 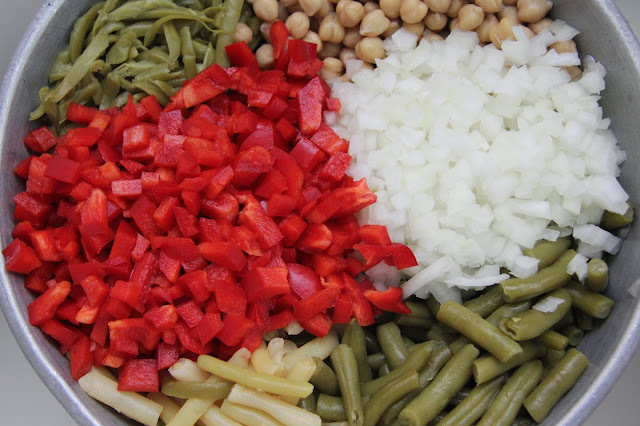 Drain and rinse the canned beans before adding the bell pepper and onions. 1. In a large colander, drain the beans and rinse under a shower of water. Give the beans a good shake to release trapped water and let drain for a few minutes, shaking a couple of times. 2. In the meantime, in a saucepan combine the water and sea salt. Over medium heat, let the sea salt dissolve, stirring occasionally over the course of five minutes or so. Once the salt has dissolved and the water is hot, but not boiling, turn off heat. Stir in 1-3/4 cups runny honey. Stir to make a honey syrup. Add 2 cups red wine vinegar. Stir and set aside. 3. Finely dice the red bell peppers and yellow onion and add to drained beans. Toss gently to mix and transfer to a container with a tight fitting lid such as a Cambro. (A 4-quart Cambro is the perfect size for this recipe.) Pour the cooled marinade over the bean mixture. Seal with lid and shake to distribute the marinade over the top of the beans. Refrigerate. Every once in awhile shake the container to redistribute the ingredients and let sit for a minimum of 24-hours in the refrigerator before serving. The salad will keep a month or so, stored properly. Serve with a large slotted spoon to allow the marinade to drain back into the bowl. Cover and allow the mixture to marinate for twenty-four hours before serving.